Savvy fitness center owners know that there is a lot more to choosing wall graphics than merely displaying the latest celebrity cut-outs and graphics that hit the market. In fact, there is a good bit of psychology at work here. If it is your job to commission the next order of wall, floor and window graphics for Chicago fitness centers, take a look at the findings that the experts have come up with. The IDEA Health & Fitness Association reveals that the desired outcomes of exercise differ by age group – in some cases. Evaluating a variety of international studies, the experts discovered that 87 percent of adults who regularly exercise do so with the goal of achieving good health. This was true for men and women as well as participants of all socioeconomic groups. While common wisdom suggests that consumers hit the gyms to achieve an attractive physical appearance, this is actually not the truth. Focus on healthy behaviors such as hydration and post-exercise nutritional choices. Get away from body image graphics. Address younger fitness club members’ need for competition. Does this sound like a tall order? It does not have to be! At Mark Your Space, our wall graphics experts have plenty of experience putting together decorative signage packages for fitness centers. How do we do it? Client interview. We find out what your membership looks like. Do you have primarily older adults who exercise at your gyms? Do you cater to a younger male clientele? After reading up on the psychology of exercise, it makes sense to incorporate this knowledge into your signage selection. Message formulation. We work with you to formulate the message of the lettering and the look of the graphics. When your clientele consists of younger men, you may wish to go with images of Bruce Lee (for example) and his sayings for motivational purposes. When you have a mixed clientele, your decals may feature images of the healthy shakes and juices you offer as well as messages from famous health authorities. Display choices. Wall graphics easily take the place of wall art. In an area where space is limited and cumbersome cardboard cutouts conflict with range of motion exercises, walkways and equipment storage, the wall graphic is the perfect means of beautifying the space. Windows are another great display area. 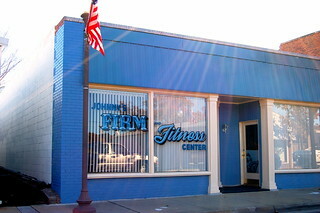 Rather than having your customers on display as they are exercising, install a window perf that allows them to look outside while those on the outside see your marketing message that addresses their health concerns. Window decals are also a good solution when you are trying to add some definition to a large space with plenty of glass. 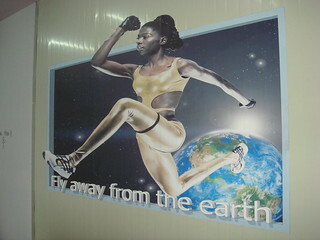 Finally, the floor graphics continue on the message of your wall space. It is here that you might consider placing advertisements for specific products, supplements or training sessions that you offer.